One potato, two potato, three potato, four... This recipe is a departure from the mayonnaise-heavy potato salad found at most barbecues across America. I like to make it occasionally over the summer months to vary the very traditional dish a bit. This version is light, tangy and delicious! 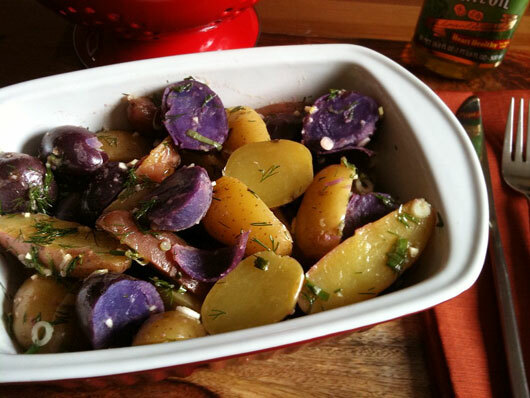 I've used a variety of locally-grown baby potatoes, including purple ones that I picked up at my farmers market to add a beautiful, rich splash of color but you can use any fingerling potatoes you choose. Boil the potatoes: Bring a large pot of cold water to a boil. 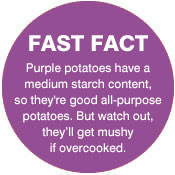 Place the potatoes in the boiling water, cover and simmer until the potatoes are tender when pierced with a fork, about 12 - 15 minutes. Drain the potatoes and slice in half lengthwise. Prepare the dressing: Whisk together the vinegar, oil, lemon juice, garlic, mustard, scallions and dill. Season with salt and pepper to taste. Place the potatoes in a serving dish and pour the dressing over them. Toss gently until just coated. Serve.